Railpictures.ca - A.W.Mooney Photo: Another photo from a favourite location, opposite the old Dundas station, catching a westbound in a typical overcast day…….as it appears most of my days off were like. This looks to be one of the trains that was eventually cancelled due to lack of ridership; perhaps the mid-afternoon #83. | Railpictures.ca – Canadian Railway Photography – photographie ferroviaire Canadienne. Caption: Another photo from a favourite location, opposite the old Dundas station, catching a westbound in a typical overcast day.......as it appears most of my days off were like. This looks to be one of the trains that was eventually cancelled due to lack of ridership; perhaps the mid-afternoon #83. Those 6 axle deluxe coaches were really nice to ride in. 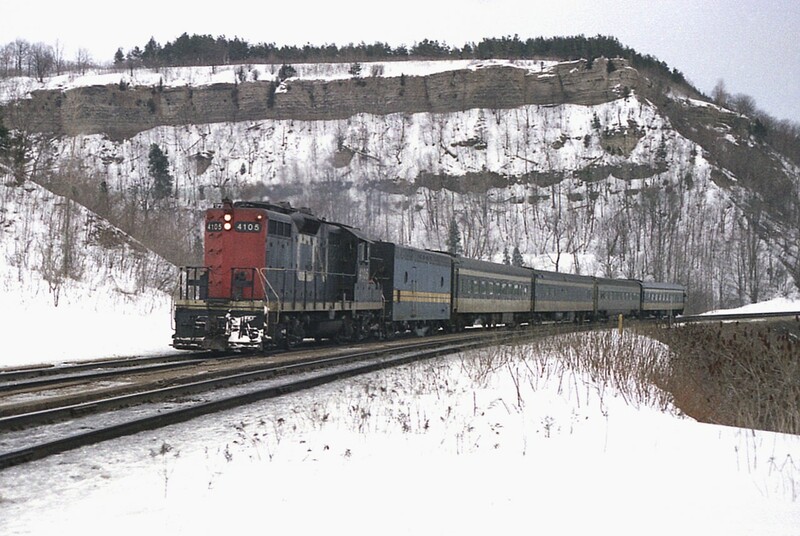 In 1976, I went from Edmonton to St. John, NB, by train. The local from Moncton to St. John had one of them assigned to it. I particularly enjoyed the Men’s Smoking room…had a nice stogie in it sitting on a comfortable couch! Also, the second car is a 750-series Cafe-Lounge. These were usually reserved for longer-distance trains, and their use in corridor trains was uncommon. ’tis certainly a former “Crusader” car in the third position. More interesting, however, are the first and last coaches, which were 1947- or 1950-built 6-axle “deluxe” coaches. By this point they were used primarily on commuter runs or during the busy season around Thanksgiving or Christmas – and not so often on a regular day like this. No idea. But it certainly appears “different’. Perhaps a VIA enthusiast could weigh in on this. Is the second to last coach a former Reading Crusader car?